One of the major reasons that people have trouble falling asleep is all the things they are thinking about that they have to accomplish in the next day. That is why it is recommended that you write out a list before going to bed of all those “to do” tasks. It’s a way of telling your brain “you’ve got this.” That should help you relax. It can also help you relax to be in a comfortable environment. It’s not just about the kind of blankets you have on your bed but about how free from clutter your home is. If everywhere you look there is something that you’d like to toss out, then it’s time to bring in Junk King Cleveland. These are the junk removal experts that take decluttering to a whole new level. You’re going to be assigned a two-man team to facilitate your decluttering session. Think of them as your personal moving crew that you get to direct around your house. They can literally go into any room you want to remove what you want taken away. It doesn’t matter if they have to go up into the attic or down into the basement. Only you can make the final determination as to what is considered clutter. With Junk King Cleveland on the job, weight and size should never be a factor. Your team will be able to move any heavy object or take apart something in order to load it onto the truck. In the past, Junk King teams have literally cut a hot tub in half in order to get rid of it. That’s what we call problem solving! Everything you turn over to Junk King Cleveland has a chance to be dropped off at a local charity. 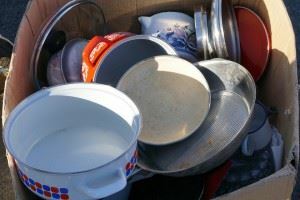 You might have tried to get rid of some of your items in the past in this way and found that many charities are limited with their ability to pick up certain items. There are no restrictions with what Junk King Cleveland can take away in terms of furniture, appliances, household goods or clothing. It doesn’t matter what kind of shape they’re in or whether you think they could ever be used again. All that matters is that you want it gone. To help clear your mind and home of clutter, Junk King Cleveland is the perfect partner. This entry was posted in Uncategorized and tagged Clutter, Junk King, junk removal on December 31, 2016 by Ivan Baker. Last updated August 8, 2017 .